The Storm Whale is a children’s picture book written and illustrated by Benji Davies, and published by Simon and Schuster, 2013. You might recall I promised a review of The Storm Whale earlier this month when I reviewed On Sudden Hill. I’ve also added some activities below that might help parents, teachers and librarians extend the literature experience for The Storm Whale. This is a gentle story in a beautiful children’s picture book. 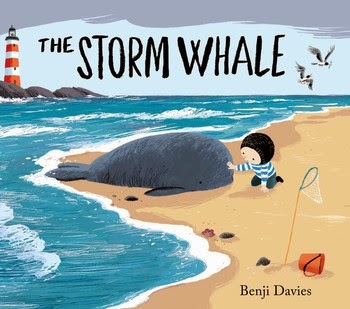 I know I tend to only review children’s books I really like, or, more importantly, think that children will really like, but The Storm Whale is truly becoming a firm favourite. Each time I look at it, I find something new to value. I know librarians and teachers will appreciate what The Storm Whale offers as a resource to support studies of the environment and the family. Kids will adore the illustrations and the story. The Storm Whale is a great vehicle for developing children’s visual literacy skills. The first sentence tells us, “Noi lived with his dad and six cats by the sea.” Can kids find the six cats? How has the artist made finding them a little difficult? Can they make a picture for a friend to find several items with some almost hidden in the same way? We rarely see Noi’s mouth. Where do we see it, and why does the artist show us Noi’s mouth on that page? We read that Noi tried to make the whale feel at home. What might we infer from the illustration that he did? The end papers are both double page spreads of whales in the ocean. Can children see a difference between the illustration at the front of the book and the one at the back? What may have motivated the artist to make that change? Older children could discuss whether it was the right thing to return the whale to the ocean. Is it always easy to do the right thing? Have they ever done something difficult that they knew was right? How would they go about getting a whale from a bathtub in a house to the ocean? Can they write a detailed plan? Do they think Noi might be lonely in the future when his dad must work such long hours? What advice would children have for the dad? Here's a Pinterest board with activities, crafts and other ideas based on The Storm Whale. You can find more Children's Book Reviews on The Book Chook by clicking Reviews in the right sidebar.